My husband and I purchased our flat safe storm shelter in the winter of 2011. My hope was to never have to use the shelter, but with two small kids I wanted to have a safe place to go in the event of a severe storm. May 20th was heating up to be a terrible weather day. I had taken my kids out of school and we were home watching the weather. I realized that if the tornado stayed on its present course that we would take a direct hit. We grabbed a few belongings and went to the cellar with a few neighbors. I shut the lid to the cellar. Then, I hooked up the chains that helped secure the lid. We had installed a few battery powered lights to help us to see while we waited out the storm. Within ten minutes, we could hear the massive tornado getting closer. When the tornado hit the house it was so loud that we did not even hear the house break apart. The only thing I could hear was the roar of the storm. I do remember the wind blowing into the cellar from the small opening under the lid, but it was a gentle breeze compared to the destructive winds just above us. Within just a few minutes, the storm had passed. I told everyone we would wait until we couldn’t hear the roar of the storm before I opened the lid. However, when the time came, the lid wouldn’t open. The tornado had destroyed the garage and moved my car. My car now was sitting directly on top of the cellar. The back wheel was sitting on the lid and I could not force it open. However, flat safe also installs a winch in their storm cellars. So, instead of having to wait for someone to come rescue us, my neighbor and I hooked the winch up and opened the lid with complete ease. 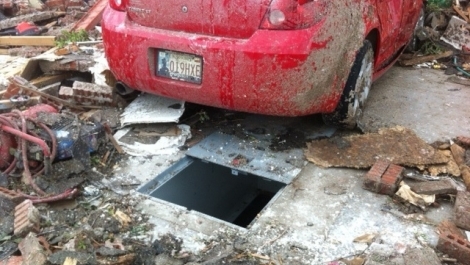 Even with my car and lots of debris on top of us, the lid opened with no difficulty at all and we were out of the cellar within just a few minutes. We took a direct hit from the tornado. Our home was completely destroyed. We literally had nothing but the clothes we were wearing and a few personal items we had taken to the cellar with us. But, we did not have a scratch on us. We took a direct hit by the funnel of an EF5 tornado and we came out of our cellar without a scratch… Thank you Flat Safe. You saved all our lives.